Harry Maguire celebrates his goal for England against Sweden. One of Peterborough United’s summer signings is not surprised at the impact made by England central defender Harry Maguire in the World Cup. Maguire was a goalscoring hero as England beat Sweden 2-0 in a World Cup quarter-final on Saturday (July 7). Louis Reed's playing role model is Paul Scholes (pictured). He was also the captain of Sheffield United when Posh midfielder Louis Reed made his Football League debut at the age of 16 for the Blades in 2014. Reed was an admirer of Maguire then and remains one now. “You could tell when he was playing for Sheffield United that he had a lot about him,” Reed told www.theposh.com. “He always looked destined for big things. “He was captain when I made my debut and it’s very pleasing to see him doing so well. 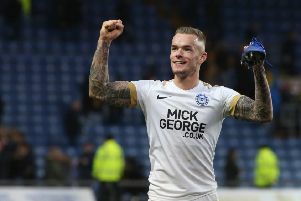 Reed has played in both Peterborough United friendlies so far this summer and should have a third run out when Steve Evans’ men make the short trip to Lincoln Road to play Peterborough Sports tomorrow (July 10, 7.30pm). The 20 year-old spent last season on loan at Chesterfield - where he played with Harry Maguire’s younger brother Laurence - and he feels the move will help him as he aims to make an impact at League One level. Chesterfield finished bottom of League Two. “I’m delighted to be at this club,” Reed added. “Last season was massive for me. I hadn’t played much in two seasons so I needed to get out and get games. Obviously the season didn’t end well for the team, but it was good for my personal development.